The Great Khali shocked the world when he returned to help Jinder Mahal retain his WWE Championship in a Punjabi Prison Match. If you have been paying attention to dirt sheets you will learn that the latest rumors are there the WWE plans to pull the plug on Mahal's title reign due to the fact that there is not as much money in India as they thought. Seriously? You mean to tell me that a BILLION dollar company didn't do their homework? Absolutely not. Bringing Khali back changes things. 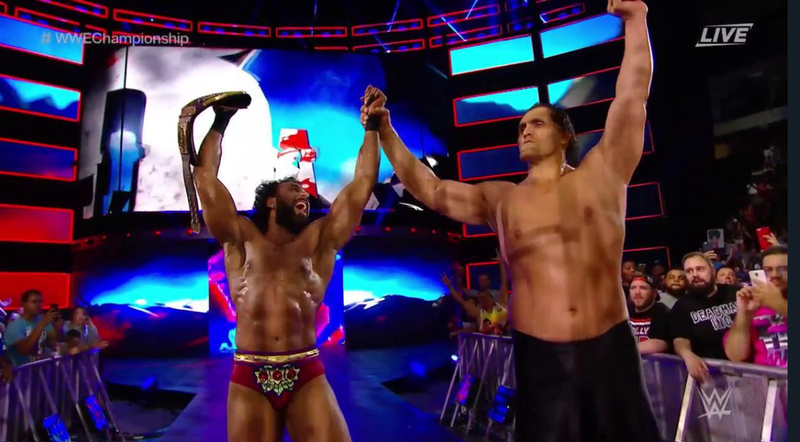 At one point there was a story where Khali and Mahal were family members. I always believed that could be the main event storyline. Now we have them together and this is the start of something big to come. There seems to be something missing from Mahal's title reign. It does not help that he is been in the same feud since he got the title, but if he can move on from Orton, then perhaps we see him closing the show. Let's be honest, there has never been a time that you were so happy to see Khali. As Mahal said, family sticks together.